Mona studied Chemistry at the University of Birmingham with a particular interest in Physical - Organic Chemistry. 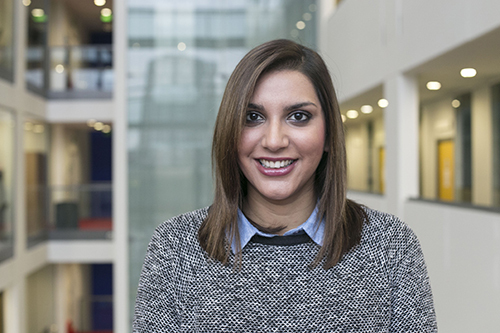 After previously working as an Employer Engagement Adviser at City, University of London, Mona now heads up the Employer Engagement team and is responsible for supporting the continued development of the team and implementing of the Careers Service's Employability strategy. She is responsible for developing links between City and employers, sharing information about employer trends and activities within the Careers Service and other groups around City, supporting the development of the SME market and providing a Career Management consultancy to academic colleagues. Her team deal with planning and delivering a range of employer events around campus. Mona is an experienced employability professional with a strong background in recruitment. Having worked for external agencies including The City of London Corporation and Michael Page, recruiting across a broad range of sectors she has also got a lot of experience managing and delivering local government employment initiatives, such as the welfare to work programmes including The Work Programme, helping long term unemployed into sustainable employment fields. She is a trained facilitator and has delivered a number of workshops and presentations tailored around employability such as CV writing, interview techniques and creative job hunting. She most recently worked as an Employer Partnership Manager at the University of Greenwich where she created exclusive links and partners with employers and as an Employability Advisor at London South Bank University, where she worked alongside a team of Employability Advisors and focused on supporting students and graduates to help them find employment, placements and internships, before re-joining City.